Yay! Finally found time to create my userpage heee :3 I am a new user here, and also pretty much very new to the Elder Scrolls. I have been anonymously using UESPWiki for quite some time as a guide throughout my Skyrim adventures (which I find very useful), and then one fine day, I found myself quite bored and decided to finally join UESPWiki. Hmmm... for the past few days, I seem to enjoy taking in-game screenshots, especially those beautiful scenic views in Skyrim. I somehow have taken an interest in taking pictures, and have uploaded a number of screenshots of NPCs or places for the wiki. They are not very high quality though, since I only play on a 1360×768 wide-screen, and I have to crop my screenshots to 1024×768 to get 4:3 aspect ratio set by the guidelines. Anyway, here's just a few out of the many screenshots I uploaded for the wiki: this one is for the quest Kill Maluril, and this one is for Blood's Honor. Guard: "What is it? Dragons?" Psylocke: "Yeap, and a lot of them! Comes with every flavour too!" Heee :3 All that was a lot of work, but it was fun! And it really paid off! 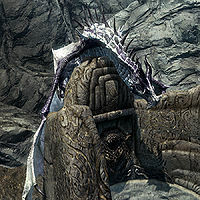 Well.. dragons do make up a large part in Skyrim, and their images are lacking, so I told myself why not make the wiki more colourful? So far I took over fifty screenshots in all, then choose the best among them and crop them to the correct size. Well, I think each and every one of them is spectacular in its own way :D. I contributed images for places and NPCs as well, especially those needing cleanup and such. I find this link and this link useful and convenient. But I won't stop there! I'm going to continue taking screenshots in Skyrim. Those dragons especially.. beautiful but deadly. It's just wonderful to watch in an odd way when I'm taking my screenshots... like a front row seat at a forest fire. And that's the reason I made a little gallery of my dragons at the bottom of my userpage, so I can gawk at them for an hour every day XD. Wow, that's a lot of things for my 'to-do list' here... although I'm keeping up rather well with my self-imposed tasks on this wiki heee. I made just over 400+ edits in my fourth week here :D (Not bad... not bad at all... xD). Anywaes, I have contributed a lot of edits lately (maybe a little too much..?) and to my amazement, I'm ranked in top 100 active users (yeap.. wow xD). That's really quite a lot of edits! For a relatively new editor, I actually feel a great sense of satisfaction, knowing that I have improved various articles, from itty bitty grammar mistakes to adding lots of content. Even now, I'm currently revamping Skyrim:Delphine in my wipsandbox... It's been taking very long to revamp the article, but little by little, the article is growing every few days (and here's hoping that I can maybe outshine Legate Rikke or Cicero!). I'm quite proud of what I've done for my WIP so far, and it looks great so far; I practically wrote most of the article and uploaded all of the images too! And speaking of images... there are quite a number of images that I uploaded recently for various articles, so let me just share with you just a few of my screenshots, mostly taken in mid-combat, which I think are quite awesome and cool (well... they are to me, at least xD). These are images of a challenger, Lucien, a traveler, a vampire assassin, and Rulindil. Guard: "Keep your arrows in their quiver, archer." Hmmm... some of you may be wondering why I started off with that quote. Well, that's because I'm an archer now! (No, not in Skyrim, but in real life!) I always liked archery since young. It all started with Legolas in the LOTR trilogy, and countless other movies, as well as games, in which I usually play as an archer (like MapleStory :D). And recently there is Katniss Everdeen in The Hunger Games, and of course Hawkeye in The Avengers (Hawkeye is so hot! :3). Somewhere in early September, I finally decided to pursue my passion by joining an archery course. Archery turned out harder than I expected! Concentration and stability is key when aligning your shot. I can now shoot 10- and 20-metre targets quite well, and (just to show off a bit xD) I just bought my personal archery equipment yesterday. My bow is a carbon-based recurve bow which cost me close to 400 SGD (Singapore dollars); it's slightly taller than me when assembled and strung xD. My quiver consists of 18 aluminium alloy arrows with fletchings which cost me 20 SGD apiece, and I also bought other miscellaneous equipment. Oh wow... Look at the difference between the date of this post and the previous one LOL. Looks like technically I've been around for more than a year now, although in actual fact, it's probably around 8 months, since there was a period of 5-6 months when I was completely dormant. Yeap, it's that time of year again; 2013 is slowly coming to an end, and we all know the harbinger all too well: final exams. Okay, this page is waaaaay too long, seriously... Perhaps I should move my posts to a new page. Someday I gotta condense this and make a proper userpage. Okay then, back to edi— I mean.. studying! This user is from Singapore. 27 This UESPWikian is 27 years, 4 months, and 3 days old. This user practises archery in real life. This user has been on UESPWiki for 6 years, 9 months, and 25 days. This user has made a grand total of 9,504 edits in 2490 days. This user has been awarded with 11 prizes! This user plays on a 20.5"
This user is a Dark Sister. This user is a Nightingale. This user is an Archmage. This user's Bunnies Slaughtered count is 0. This page was last modified on 27 March 2019, at 14:08.